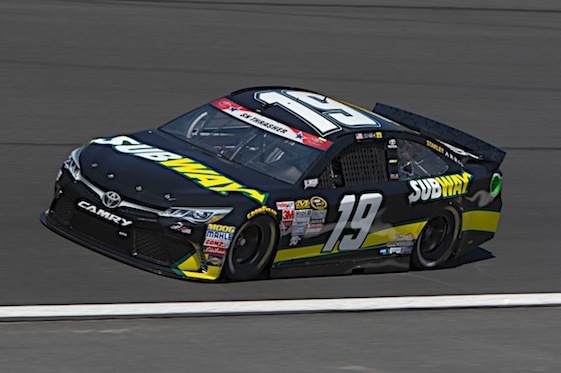 Carl Edwards proved he can execute a back flip from the window of a Toyota as easily as he can from a Ford on Sunday night. Edwards got his first Sprint Cup Series victory since switching from Roush Fenway Racing Fords to Joe Gibbs Racing Toyotas this season as he captured the Coca-Cola 600 at Charlotte Motor Speedway on Sunday. Greg Biffle, Edwards’ former teammate at RFR was second. Dale Earnhardt Jr. of Hendrick Motorsports was third while Matt Kenseth of RFR was fourth and Martin Truex Jr., who led the most laps in the race, was fifth. Edwards got 62 laps out of his last tank of fuel and took the checkered flag 4.785 seconds ahead of Biffle, who also was on a fuel-saving strategy. Edwards, a native of Columbia, Mo., snapped a 49-race winless skid with the victory. It was the 24th win of his career in Cup and likely lands him a berth in the Chase playoffs.